Several planes look a little odd, or have attachments that look odd, and so some people feel they must be part of a decades long conspiracy to spray stuff into the atmosphere to alter the weather or reduce the population. That’s obviously nonsense, but what are these strange planes? What is it? It’s a Boeing 777-200LR Worldliner, specifically it’s WD001, a plane that was used for flight testing. The original photo can be found here – note the “Hazmat” text was added later. The barrels contain water, which is pumped around to shift the center of gravity to test various flight characteristics. 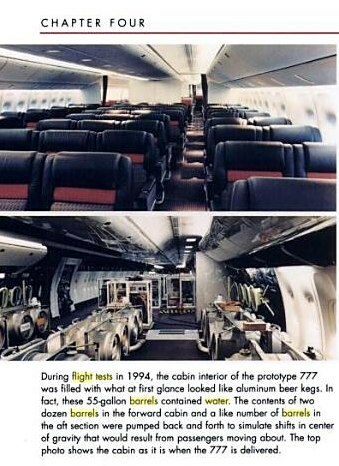 Here’s a description of a similar setup from the 2002 book, “Inside Boeing, Building the 777”, page 76., describing tests done in 1994. Remember, we test at the extremes of the weight/CG envelope. This requires us to control the CG during ground and flight conditions. We can move weight, in the form of water, forward or aft with the use of the water ballast system. This system is comprised of 48 barrels, each capable of carrying 460 pounds, connected by tubing to a pump. A computerized system tracks fuel placement, fuel burn, people placement, ballast, flap setting, landing gear position and water barrel quantity. The information is processed to display the airplane’s current CG. We move water or specify fuel tank usage to configure the CG within the specified test requirements. Why are there overhead luggage compartments? It’s a test plane, and for FAA certification they have to demonstrate that everything works. That includes stuff like the emergency oxygen system, and more minor things like the luggage compartments. It’s a requirement that they don’t pop open in flight – so that needs to be tested. They are also handy for stowing the engineers’ stuff. 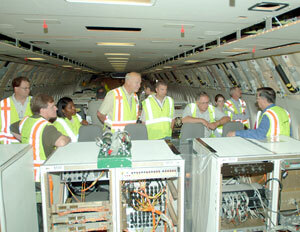 And a lot more photos can be found on Boeing’s site. Very sinister looking tubes, but why are half of them facing the wrong way? The plane is not for spraying the atmosphere, it’s for sampling the atmosphere. 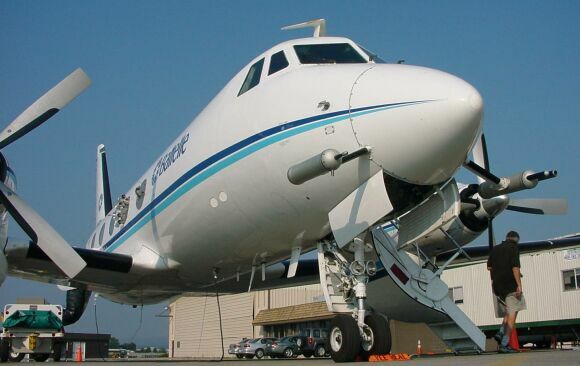 It’s a research aircraft, registration N701BN, operated by th e department of energy’s national labs. It’s pretty much one of a kind, so it’s hardly likely to be responsible for all the persistent contrails we see every day. The research is mostly on pollutants in the atmosphere, particularly from coal and oil burning power plants. 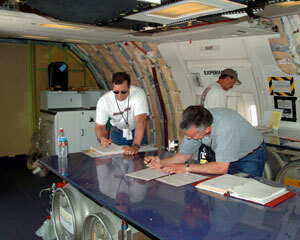 But they also investigate the properties of clouds, which includes contrails. Actually it IS a spraying device, but quite innocuous. It’s on an NKC-135A (55-3128) with the refueling boom modified to spray water. 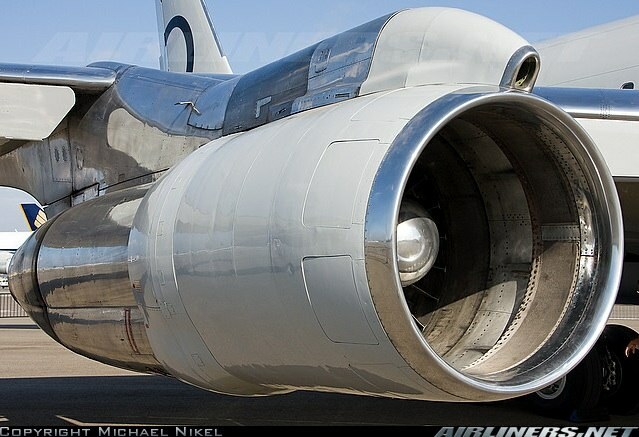 This used by the air force to test icing of planes in flight. It looks like this odd assemblage is also creating some wingtip vortex contrails as well. The plane is pretty much all white, which is something you hear mentioned from time to time in “chemtrail” conspiracy theories. 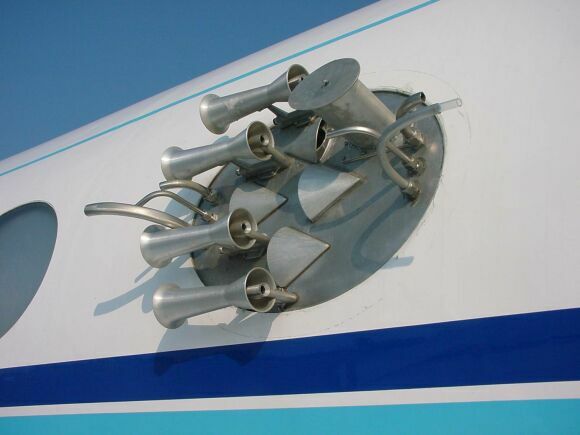 Six smoke generators were installed under the wings of the 747 to provide a visual image of the trailing vortices. 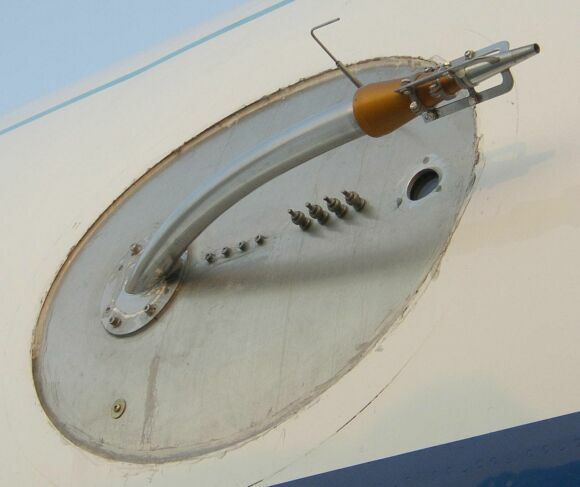 The object of the experiments was to test different configurations and mechanical devices on the747 that could be used to break up or lessen the strength of the vortices. The results of the tests could lead to shorter spacing between landings and takeoffs, which, in turn, could alleviate air-traffic congestion. This is obviously not a contrail, it’s far too low and the trail is dropping too rapidly. It’s a Boeing 747-100 “Supertanker”, modified by Evergreen Aviation, the only one of its kind. Specifically designed for fire fighthing. That’s it dumping water. Here’s some more recent photos. Here’s a video of it in action, titled “B747 chemtrails”. It’s interesting reading the comments, as the first comment correctly identifies what it is, and then everyone else just ignores that and starts speculating. This one looks like a plane spraying stuff. But again it’s rather close to the ground. It’s actually taking off with the assistance of rockets. It’s not spraying, that’s just rocket exhaust. 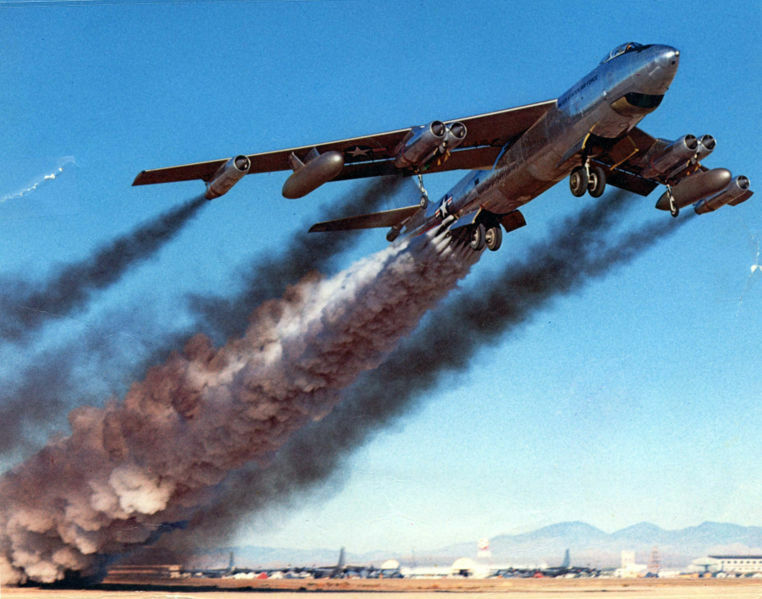 This particular plane is a Boeing B-47B, rocket assisted take off, April 15, 1954. An no, that’s not a contrail in the sky behind it – it’s rip in the photo. Click on it for a large version from Wikipedia. 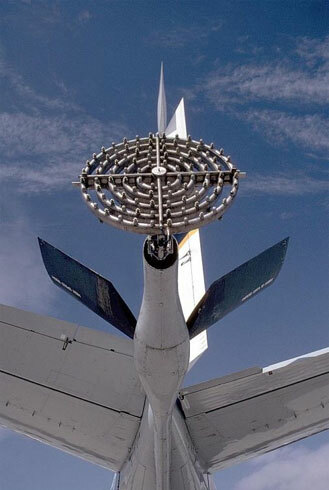 This one is used for cloud seeding. It does not actually spray anything but uses silver iodine flares that are either ejected, or burn in place. It’s operated by the Sandy land Underground Water Conservation district of Plains, Texas, as part of their SOAR program. They have some more photos of similar equipment on their site. They are all small aircraft not capable of getting to the above 30,000 feet where contrails normally form. 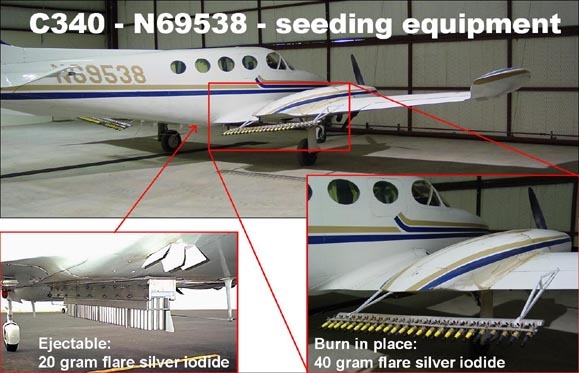 This next photo is also of silver iodine flares, fixed underneath at large plane. 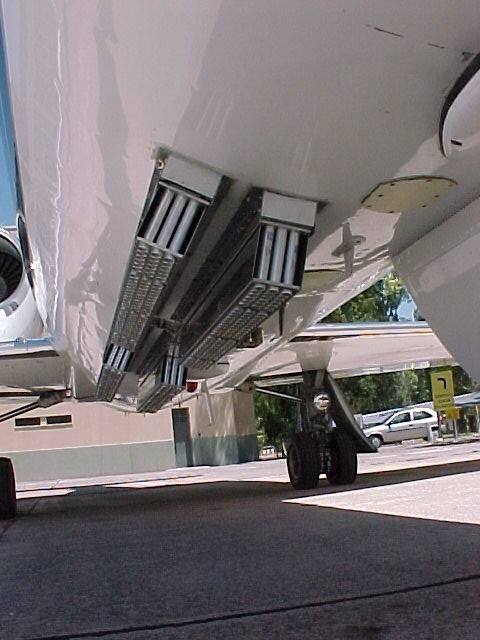 WMI racks for ejectable flares are mounted on the belly of the aircraft fuselage. Each rack holds 102 cartridges. When fired, the pyrotechnic is ignited and ejected from the aircraft. In this configuration, the WMI Lear 35A is equipped with four 102-count racks for ejectable glaciogenic pyrotechnics, a total of 408 flares. Here’s another, this time from North American Weather Consultants, Inc. 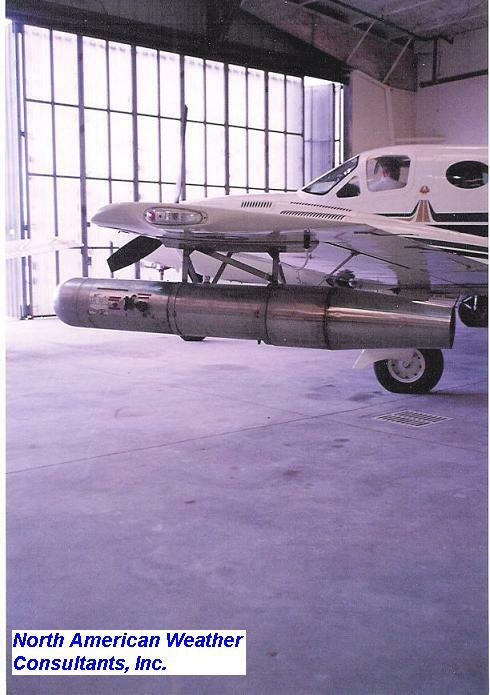 This aircraft-mounted cloud seeding generator is fixed in place, and can burn a silver iodide solution during flight. 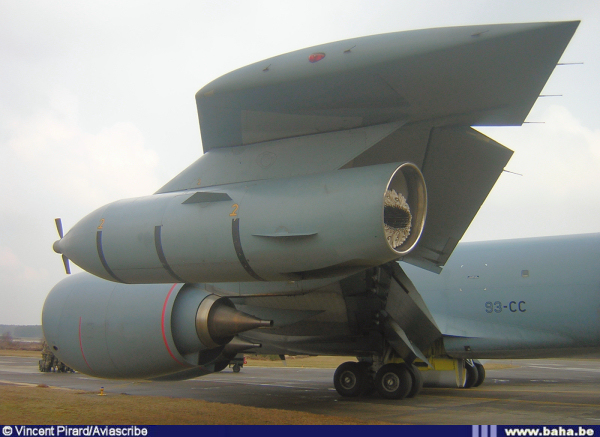 This one is the “Mk.32 drogue-type underwing pod on the Armée de l’Air Boeing C-135FR Stratotanker” (“93-CC”- s/n 63-8472 of GRV 93). 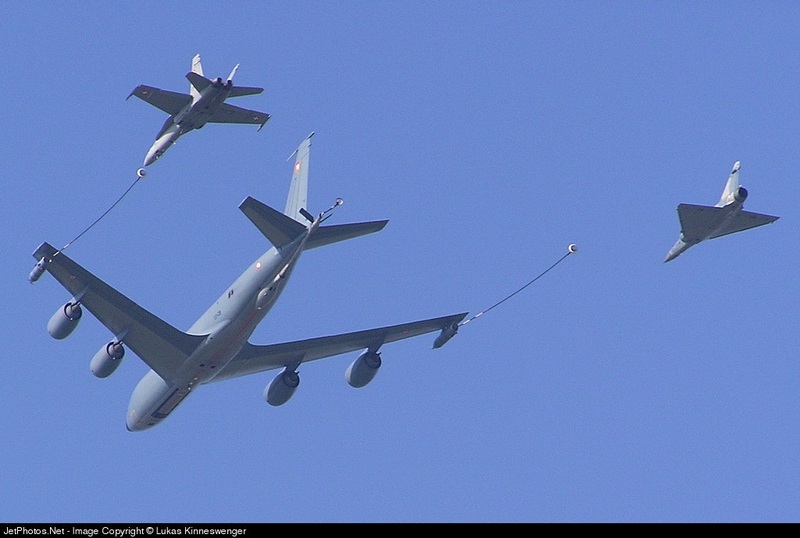 It’s an in-flight refueling system on a French Boeing C-135FR Stratotanker, photographed in Canada, Feb 2005. 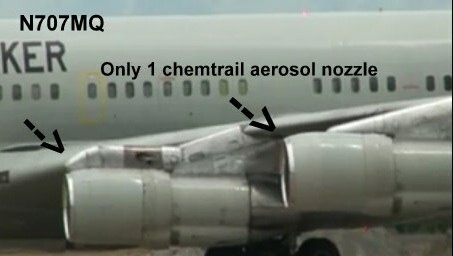 The following is supposed to be a plane that has “chemtrail aerosol nozzles” over three of the engines. Can anyone tell me if the Marcus K Dalton that seems to be central to all this is the same Marcus K Dalton convicted of securities fraud? Prior articles list him as the managing editor of the las vegas tribune but his name is not listed as current in that position. I get a bad eye irritation and bad sinus congestion until I have a huge headache. a carbon tax on all of us. not spray any kind of chemical in our atmosphere. Please stop making excuses, you are not fooling any of us. clear blue skies all year long. Charlie, other people HAD noticed the trails back then. There were just far less off them. Various factors make persistent contrails more common now: the number of flights, the type of engine, and the altitude flown at. These have obviously all changed since the sixties. Where did you grow up? Location makes a big difference as well. I you were to estimate, how many contrails would you say you saw between 1960 and 1980? Now, what about this quote from a 1970 paper? These scientists from 1970 think it’s a “familiar sight”, so what’s going on? Are they lying? Or did you simply not notice, or remember, any persistent contrails before 1980. Consider also that many people did not notice them until 1990, or 1999 (the Art Bell show that started the whole thing). If you noticed them 20 years before other people, then maybe another set of people might have noticed them 20 years before you? Perhaps that means they are not actually that unusual. Just not particularly noticeable. I’m really surprised by all of this. With all of the great education in your country, how can something like this get a foot hold? I see one problem here… the weather altering and cloud seeding devices constitute what some would call chemtrails anyway. I either read here or on the NASA page that AgI cloud seeding is incredibly ineffective and unpredictable. So unless they produce no effect in the sky, you’ve slightly substantiated a small portion of the chemtrails theory. But I have a few questions as well. It’s rude to quote something and not give the source, which 1970 paper is that from in response 105 and who wrote it? What were their affiliations (research labs, climate centers, universities, etc?) Actually, fuel dumping is also noted in some geoengineering texts. Specifically, it was proposed to tune engines to run 1% rich. That is, to make most jets and airliners add a small amount of completely unburnt fuel to act as particulates and reflect sunlight. 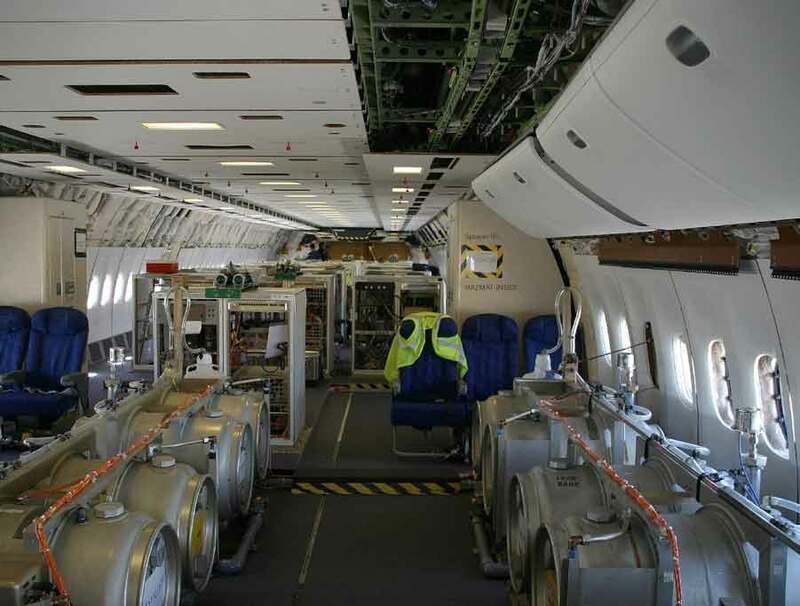 (see my post in the Barium thread for the source link) Also, you say half of the devices on the research aircraft, registration N701BN are facing the wrong way for a spraying program? I see one facing the wrong way, the singular hose in place of the front-most widow. 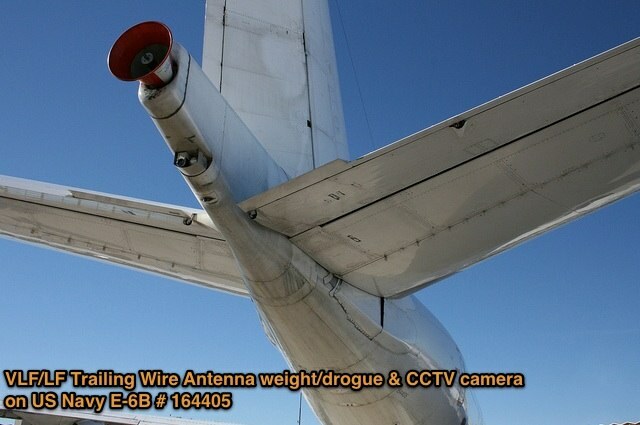 The device behind it has a large portion of the bare tubing, the tubing running into the horn looking things, and 4 out of 5 of the cone shaped pieces also face the rear of the plane. 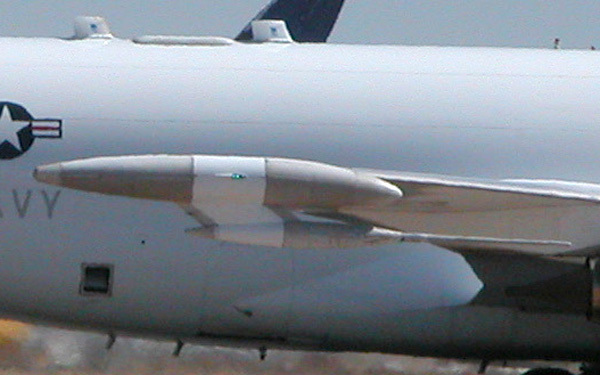 The large device on the front also faces the rear of the plane. If I recall physics properly, a low pressure vortex would be forming immediately behind the proposed collection device on the front making collection more difficult? The devices on the side appear, to me, to have tubing which enters the front and a support bar just behind that at the thinnest part of whatever they are. Could you explain how they are facing a direction inconsistent with the release of particles and consistent with the collection of particles? Or do the serve a different purpose? Can you point to a photo of cloud seeding that produces anything that people would call a “chemtrail”? Clouds seeding is done INSIDE CLOUDS. It’s not unusual, or secret. Now if you want to call that “chemtrails”, then feel free – but that simple clouds the issue – people are claiming that there are “unusual trails” in the sky that they call chemtrails. Clouds seeding does not produce trails – but now you want to call cloud seeding “chemtrails” just so you can say “chemtrails exist”. That’s just redefining things to avoid the question: what unusual trails? Sure, you can imagine N701BN spray stuff, at a stretch, but it’s hardly very efficient, it’s only one plane, and it’s very small. So it’s hardly likely to be the culprit. Besides, there’s a vast amount of evidence that it’s used for atmospheric sampling, and none that it’s used for spraying. So glad I found this site. So much to talk about and so many things citizens want to know. Whatever we are all seeing, I guess first, most all would agree whatever it is being deposited into the atmosphere and skies above us, it is a HUGE pollution problem that can often turn a beautiful clear blue cloudless sky observed in the morning, into a white haze that covers the sky horizon to horizon within a matter of hours. So let me start by simply giving an account of what I and so many others where I live see on average a couple of times per week here. I live in Mid-Missouri not too far outside of a small city of less than 100,000 with little manufacturing and only a handful of planes leaving our small airport on any given day. Many days there is simply the usual east-west Kansas City to St. Louis (or vice-versa) commercial air traffic flying over leaving only the usual quickly disapating contrails that ony last for a few seconds or a minute or so (depending on weather) or often no contrails at all from the air traffic. But, once or twice on average a week, all of a sudden dozens and dozens of planes come out like hornets swarming, flying in loops, right at each other as if they are going to hit each other making perfect x’s and looping back the way they came like they are drunk or lost. These planes no longer leave the quickly disapating contrails but look like a car with bad rings blowing out brilliant white billowing smokey looking trails and the sky becomes one huge mess filling up horizon to horizon with this rapidly spreading stuff. All the while the “regular” east/west traffic flys through often leaving NO trails or only quickly dispating ones at the same time, often even flying through the same mess left by the ‘acrobats’ but still leaving no trails. When one sees these planes one can get a pretty good idea the altitude makes little difference, sometimes the ‘acrobatic’ planes are even easier to see and appear much closer and sometimes very very low.I have heard some try to say that amateurs simply can’t judge the altitude comparisons of planes, but that I believe is incorrect, after observing for several years I and many others can honestly say altitude cannot account for the differences we are all seeing. I know some might try to plausibly deny this assessment, but after years of obseravtions I stand by this assertion as do many many others used to sky watching. Something HAS to be different in either the fuel or something else the ‘acrobatic’ planes are putting out. 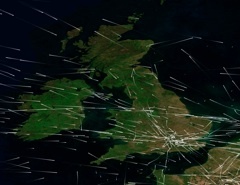 And their flight patterns are so laughable again it looks like they are either drunk or lost. Imagine driving down the highway for years where cars only leave small vapors from their exhausts and normally travel in their correct lanes. And then imagine coming upon a stretch of highway where all of a sudden every car but perhaps one or two is spewing out huge billowing white oil like exhaust and driving on the shoulders and off the road and turning around driving back into coming traffic and driving in circles. That is the night and day difference type thing we are often experiencing here in the skies over Mid-Missouri. SOME type of operation is absolutely OBVIOUS though what it’s intent is can ony be guessed at. One other thing about this massive ‘pollution’ coming from these operations is that the exhaust looks brilliant white when viewed in the light of day, but once the sun hits the horizon at sundown this stuff looks brilliant red, and then when the sun goes almost away at dusk one can see this stuff looks like very dirty soot hanging in the skies and even starting to drip like precipitation down toward the ground, really really nasty looking. I suspect this is some kind of ‘cloud seeding’ with perhaps an element of cloud creation as part of the protocol. I think it is obvious if we have cloud seeding programs (as cloud seeding program budgets have been reported for many states) I would suspect on days without clouds that clouds could and would first be created in order to seed into. I’ll stop with this to get some feedback. T.A. Perhaps you could provide some video of what you are seeing, so we could discuss it. The contrails changing color as the sun goes down is a result of the sun going down. They appear red when the sun is low on the horizon due to the scattering effects of the atmosphere. They appear gray after it has set because the sun is no longer shining on them. In this respect, as in most others, contrails are exactly the same as clouds. Left Tn, reside in rural area in Ky. now. 3 days of spraying this week, none all summer–respect for crops, this is an ag state–cloud seeding??? In October??DUH! On the third morning, I saw something I’d not seen ever in Tn. spraying. Within 30 minutes, the mist, vapor, chemtrails, had swelled, turned grayish, and covered the entire sky with a thick, ugly blanket. No longer pretty, wispy, cotton candy clouds, oh no. Returning from a dr. appt, 35 miles south, I noticed lots of holes where the spray was not uniform and the sky and sun were visible–telling me the shield was there between me and the upper atmosphere. I read somewhere this is a repair for a hole that had occurred over time (due to certain conditions)in the shield over our atmosphere. It lasted 36 hours before the sky cleared and became clear blue–YOU STOLE OUR SUN!!! 1) second day of spraying with chemtrails, a jet flew right in the line of the orchestrated event and left contrails contrasting the chemtrails–quite convincing that these weren’t contrail planes. 2) how many plants are you paying to post here?? no matter, all countries counted, we have millions against your 5 ‘debunkers’. 3) as Wildwelder az said, give us a break. I’m not 19–I’m 58, and you can’t tell me I don’t know the difference and being at a pool most days for 15 years, I have also seen the difference in spray compositions over the years. 4) I just read a German scientist account of weather manipulation –add that to our military reports–bingo–barium for creating a shield to try to undo atmospheric damage by industrial nations for 50 years. 6) Kucinich, we trust, a paid ‘debunker’ like you, we don’t. 7) Your test results are compromised to say the least–I doubt if these children haven’t figured that out by now. 8) Your witnesses? ?see number 7. If you can pay pilots to poison their own children, who is beyond being bribed?? 10) Conditions for these ice crystals forming are not right for these low-flying planes to make contrails; therefore, they are chemtrails containing hazardous chemicals. “Our lives begin to end the day we become silent about things that matter.” ~ Dr. Martin Luther King Jr. Thanks, This American, you’ve just described an identical account of the poisoning here. almost away at dusk one can see this stuff looks like very dirty soot hanging in the skies…………………. and it’s sinister looking, not a pretty color when the sun shines through. I agree. My account–in Tennessee, I also attributed the black soot on my feet(barefoot girl, here, always)to the industrial area where we lived. In rural Kentucky, not a day of soot until last Friday, first day of spraying and when I came in from getting my tomatoes, first time all summer, guess what was on my feet??? Couldn’t be industries–I am in Kentucky country, rural!!!!!!!! Black, oily soot from the grass just as in Tn, but never here until first spray?? Coincidence?? ?Hell no. Poison was on my feet and it had to have come from those chemicals from those planes. If they are contrails, then why didn’t I see this in the 20th century? I have been a sky watcher my whole life and these just started up in my area around 2001. You honestly think that condensation trails are just being noticed now by people? Who the hell is paying you? Nobody is paying me. I wish someone would. I think there asre simply more contrails now, and not everyone noticed them in the past. Seeing as the vast majority of people have not noticed anything odd NOW, why is it odd to consider that you might not have noticed them yourself until recently? Especially as air traffic drastically increased over the last 20 years. I wasn’t entirely sure how AgI seeding worked, thanks for clearing that up. Question everything, and question what you believe harder… directed at both the contrail people and the chemtrail people, and people in general. Remember that traffic to local airports is very unlikely to leave contrails, as it will generally be too low. Contrails form for traffic that comes from, and is going to, airports that are hundred or thousands of miles away. San Diego to Paris – that kind of thing. Heh, if I can get a clear pic do you think you could identify a jet from a mostly bottom view? I know the low flying ones aren’t spraying anything or forming contrails… I used some site that combines google earth, virtual earth, USGS surveys, and a few other satellite image sources to look at Pittsburgh’s airport and all of the air force planes (that are visible) are quad engine and dark grey. 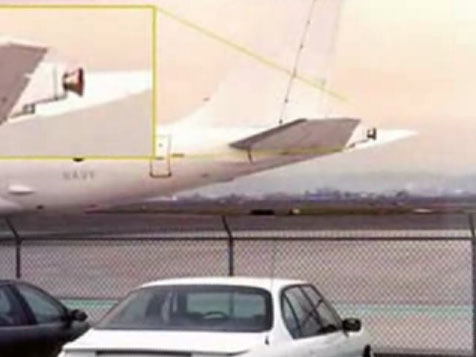 They look like tankers or transports, dual jet engines mounted on the wings and appear to be basically all white. I’ve never noticed them on a clear, sunny day… only on days with many trails or cloudy days in which there could be trails above. But then, like I said, they tend to run silent and if I don’t see trails I’m not looking up nearly as much. 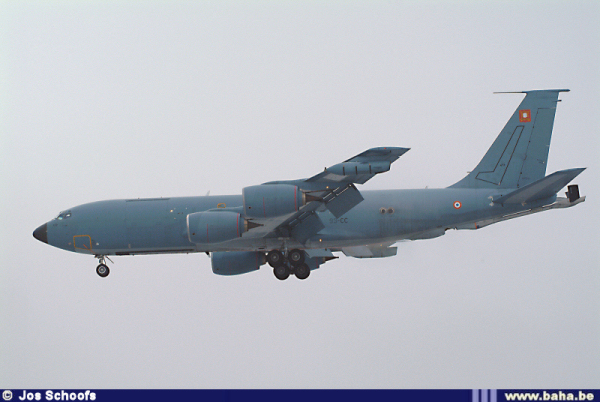 Military planes are grey or white for camouflage reasons. Actually, looking at Google’s images of PA airport, the big military planes are not jets, they are prop planes. Uncinus please explain to me which year was “Supersaturated persistent contrail” discoverd? And why do i hear high frequency tones every time i see a chemplane, aurora borealis?? I don’t know why you hear tones. What a load of crap!,this is prob a CIA operated site,don’t believe this garbage.Chemtrails are real i watch them every other day.I have footage of planes almost side by side,one dumping the other not.This site is complete disinfo.and you should be ashamed of yourself.But i suppose I’m just a conspiracy nut ugh,i spose you think Lee Harvy Oswald killed JFK,and the gulf of tonkin really did happen,give me a break.I advise everyone(except you indoctrinated slaves)get away from this site quik smart! It’s interesting that nearly every person who has come to this site as a chemtrail-believer also accuses Uncinus of being some sort of disinformation agent. Says something about their mindset, perhaps? Liko, instead of just randomly accusing people, you could behave like an adult and try to disprove the statements made on this site. How do you know the aircraft were flying next to each other? In RVSM airspace like in the USA the minimum separation for 2 aircraft heading the same way is 2000 feet. No man can guess the altitude of aircraft. Most pilots don’t even try. I’ve never seen five planes flying like that (except for aerobatic shows and skytyping planes). Perhaps you could show a photo of this? You might want to think about that. What if I were to show you evidence that chemtrails were contrails? The only way you can really show anyone that chemtrails are contrails is to collect the residue from contrails/chemtrails and show that there is NOTHING in the residue that shouldn’t be there. You can spout all you like about persistent contrails in the past etc and that you have the science to back it up but the truth is YOU HAVE NOTHING MORE THAN ANY OF US, because the only way to put this to bed once and for all is to do what I suggest above. What is there to lose if this is done? IF you are right all along then we are all winners. Perhaps time and effort would be better spent by us all in working out how to do this relatively cheap and simple experiment. But wait a minute, if this experiment was carried out surely the PTB would just ensure the planes involved weren’t spraying that day. Oh well…looks like we’ll have to find another way to find out! Cueball, I think that “chemtrails” are actually just persistent contrails because they look and act exactly the same. Whay do you think they are something different? Where do you get your information on how contrails should behave? I don’t wish to reveal my sources regarding how contrails should behave but I will say that I would not believe all of the sources you are using. It is very easy to manipulate data to fit a model when you are very far ahead of the rest of the field (if you get my meaning). So back to my real point – the only way to settle this would be to recover the condensation etc. in a contrail/chemtrail and test it for its property. Agree? No, I disagree. If I tested a contrail (that you said was a chemtrail), and found it just to be ice crystals, then you’d say I had tested the wrong kind of trail. A much simpler way of settling it would be to explain how contrails are supposed to behave, and then show some trails that don’t behave like that. Very simple, you can do it from the ground. Of course to do that, you’d have to explain WHY you think contrails should behave a certain way, and then we are getting into science. So, Cueball, how should contrails behave? And why? Errr no, just test the huge sky filling persistent contrails/chemtrails and not those that just disappear immediately behind the planes (or as most people would call them “normal contrails”). It’s irrelevant how I think contrails should behave, there are MILLIONS of people that don’t think long persistent contrails (chemtrails) of this magnitude are NORMAL. Not all of the people think that these “chemtrails” are trying to kill people but they do KNOW that they are not normal (in there opinion). As for it being simpler to test from the ground; this makes it sound like you do not accept my theory or are frightened of the results?? Have you read any of the science about contrail persistence? Or any of the hundreds of books and papers on clouds and contrails. Persistent contrails that spread out in a thin haze of cirrus have been studied for over 50 years by atmospheric scientists from around the World. They think persistent contrails of this magnitude are “normal”- normal results from regular air traffic. Since the FACT that persistent contrails have been known, observed and studied and even peer reviewed for so long, the burden is on those who think they are NOT benign intent contrails to show how and why they think that. Just saying it is doesn’t make it so. Learn to read scientific research on the behavior of contrails- become knowledgeable about the conditions and variables involved in their persistence. Then you can “know” what is normal and what is not. Your answer to this question, on a different subject matter, will shed light on just who you are and your qualifications as a scientist or truth seeker. Was the WTC on 9/11 destroyed by demolitions? Please answer this so I may know what/who I am dealing with here. OK SR1419 – thanks for the links. So we can establish from that info that the crap that comes out of planes affects the air and this has been monitored and sampled. Whoop di doo. I would be interested to see a break down of exactly which chemicals are present in the actual vapour trails being produced (which is all I am asking to be done). The links also say that persistent contrails (lasting 2 hours plus) make up 50% of all contrails in the US since the 60’s. Bullcrap!! If so, it has taken 36 years for people to suddenly start noticing this en-mass. Yeah right. There must have been a hell of a lot of fluoride in the water during the 60’s, 70’s, 80’s and 90’s!! And as for this being due to lower air traffic and the lack of Internet (which I guess you will use as an excuse) then I do not agree. Air traffic may have increased but internal flights and international flights in the US have still been extremely high during all these decades. As for the Internet, well maybe communication was not as quick before this, but it still occurred and even the slowest pigeon could deliver a message in 36 years. All your data confirms is that a system of altering the weather via persistent contrails/chemtrails has been known about by the PTB since the 60’s (maybe before), therefore why can’t you or your buddies accept that maybe, just maybe they are using this knowledge to control the weather. It isn’t exactly a great leap of the imagination to accept it. In fact, the evidence you provide confirms it. I don’t think the PTB are poisoning us with vicious chemicals (although a sample of persistent contrails/chemtrails could prove me wrong) but I do think that fine tuning the fuel additives of the aviation fuel to make it consistently produce persistent contrails (that allow weather modding) is not really too difficult. Ken, the WTC was destroyed by the planes flying into the towers, and the resultant fire. I’m sure you think there was a vast conspiracy. But all the 9/11 conspiracy theories regarding controlled demolition are complete nonsense. They have been full debunked elsewhere. I’m not going to discuss 9/11 further, except as it directly relates to contrails. There are lots of other places on the internet for you to discuss that subject. Stick to contrails if you want to comment here. Cueball, you know that persistent contrails contribute to global warming, right? So why would the “PTB” want to make more of them? I understand you point about how it seems to you that people started noticing them around the time that the internet took off. But do you have any other actual evidence that is NOT generated from the internet? Like, books or science papers that describe the sky before it changed? Not only does this make it sound like your sole intention is to debunk, it also shows a complete lack of scientific knowledge and a total blind ingorance. All I can say to you is read 9/11 Contradictions by David Ray Griffin and you will see that the only conspiracy theory is the one provided by George W Bush et al as the “Official Account”. It seems like you are simply trying to change the subject here. If you want to talk about 9/11, then there are many places where you can. I just want to keep the discussion here about contrails – unless there is some specific link. hate to see you go in away in a huff- Try not to get defensive just because some people are not convinced that “chemtrails” are real…. I am just providing data that you asked for and information that helps illuminate the topic. This information is out there- read all the papers I linked…and there are many more written by many scientists over the last 50 years…the info is there, you just have to want to find it. The fact is there ARE a lot more planes in the sky now than 20 years ago…and the internet does foster a herd mentality- instantly…people take a picture of a persistent contrail- post it on the internet minutes later and call it a “chemtrail” and have thousands of uninformed people nodding their head in agreement seconds later…That is the reality. No consequence for error on the internet. No legitimate vetting of information. No peer review. The vast majority of “chemtrail” believers are completely ignorant of the reality of persistent contrails and instead are under the assumption that any trail that persists more than a minute or 2 is a “chemtrail” . And they get confirmation from their herd…so it must be true. Educate yourself on what a contrail is and its known behaviors. The information is there you just have to want to know. Ken, I have deleted your follow-up post about 9/11, as it is off-topic. If you want to discuss the physics of how the WTC collapsed, then there are many excellent sites on the internet that are specifically for doing that. This site is about contrails and chemtrails. I’ve been lurking on this site for quite a while and have found the information to be informative and compelling, however I am disappointed that that you would have such a simple view of what occurred on 911. There are many of us in the world that believe that “chem trails” and what happened to the WTC may just be related. Neither issue can be compartmentalized. Ken, I would have liked to see your question answered, or at least not deleted. Anyone watching a demolition side by side with the WTC falling can clearly see that there were explosions going off all over and that was not from the planes. Additionally, if jet fuel were to burn so hot that it could melt steel, wouldn’t it be safe to assume that no planes would be able to fly because the fuel would be so hot that it would melt the fuel tank and the fuel would fall out of the planes? “Food” for thought….. how might a stove work if the fire gets so hot that it would melt steel. People’s ovens would be melting and exploding all over the world. Just my 2 cents. I’m sorry guys, but I’m not going to allow any more 9/11 talk unless you explain how it pertains to contrails. Irrelevant posts will be deleted. I’ll leave Ryder’s post, above, as an example of the type of post that will get deleted. The is a specific link between 9/11 and contrails, in the that cessation of commercial air traffic provided a unique opportunity to view contrails in isolation, and to get some data on a few days of weather with very few contrails. You say it was a unique opportunity to view contrails on 9/11. Well then, where and what information/data was gathered on that day please? PS. Thank you “Ryder” for calling a spade a spade. This is the real problem in your argument! What is “normal” and how is it that Barium is acceptable in our air/atmosphere just because it is not a chemtrail? Why aren’t you using your know how and research to raise awareness to this massive polution problem obviously creating major enviromental concerns (Blocking out the suns rays is a major concern and I don’t care how you justify it). This the problem I have with the work done on this site. You are concentrated on debunking what may or may not be a Chemtrail issue while failing to recognize that just because they are not Chemtrails or not sprayed on purpose they are “normal” or “harmless”. I challenge you to point out how this increase in contrail activity is not something to be concerned about. While the Chemtrail issue may be nothing more than conspiracy it at least brings light to a troubling situation. Your work does nothing but detract from the issue and create further ignorance by the population in general. Use your know how to justify cleaning up this mess and getting the word out to the people that are no doubt being effected by it in one way or another. I respect the work done here but I do not respect the blind eye that is turned to an issue that is by no means normal or acceptable no matter how it is justified by science or opinion. When a wave of planes flys overhead and turns a blue sky into a grey haze spotted with nicotine colored splotches at low altitudes it is concerning! In a day and age where the trendy thing is to go green and work to clean up this planet I find it astonishing that this subject gets no play at all and is just accepted as an everyday occurance! It should be investigated immedietly regardless of how or why! The fact that media and the Government (both of which can not be trusted) do not cover/debate this in any significant way leads to further speculation. David, Barium is a chemical, it occurs naturally in the ground, and that’s how it gets into the air. It’s also used in industry, and excess amounts of it count as pollution. However, nobody has shown any evidence of it being sprayed into the air deliberately in the form of contrails. I’m fully aware of the concerns of contrails contributing to global warming. I’ve discussed this several times. Uncinus are you a Disinformation Troll? Now you bring the hoax of Human Global Warming into the chemtrail discussion? Global Cooling has been happening for 2 years since the Sun Spots declined the last 2 years. Do you even know that other planets in our Solar System were also warming from increased sun spot activity until the sun spots stopped recently?? 100% of the heat in our solar system comes from our SUN. PERIOD. All energy, even gravitational energy, comes from our SUN. Global warming is a natural occurance and warmth brings life not death. Plants and animals thrive in high CO2 and warmer weather, while dying in cold weather. If your research on Chemtrails is anything like your research on the Global Warming Hoax or the fact that 9/11 was indeed an inside job (while you still provide disinfo on 9/11 subject matter), then your research DOES NOT pass any credible review. Watch out fellow Americans, this is a DISINFO site; a professional troll out to misinform you. Hi Joe, I’d prefer not to discuss other topics here unless they are directly related to contrails. Thanks for your understanding. All energy, even gravitational energy, comes from our SUN. Errr, really? How about the tides? Or the reason we don’t float off into space? That’s the Sun’s gravitational energy? I wasn’t going to respond to this, but gravity is a FIELD. The separation of one body possessing mass and another body possessing mass, each exerting their own gravitational field, determines the force between them, and thus their potential energy of separation. If you fall from a great height you will hurt yourself. Apart from that the Earth is in effect a nuclear reactor, breaking down the fissile materials within to liberate heat and outgassing radon and noble gases. And falling upon the Earth from all directions are the cosmic blasts from dying stars, merging black holes, and other more distant and less understood phenomena. The best temperature for ANY photosynthesis is 23 degrees C. How much plant life is in the Sahara? Presumably the rest of us don’t need your warning. Good luck in your last refuge. Without the Sun’s gravitational pull, EARTH and all planets would not have even formed as planets because it takes the Sun’s gravitational/energy pull to keep planets together. Planets are formed from the SUNS gravitational pull; planets would not even be “round” or even formed at all if the SUN was not here. PERIOD. The Earth’s Tides are caused by OUR MOON, another object that was put together by the power of our Suns gravitatonal pull and kept in place/orbit by the gravitational pull of the Sun. Without our Sun (hence our Suns heat & energy) there is no light, no life, no water, no Earth/Planets and thus no Solar System. Everything in our Solar System receives its energy from our Sun. There would not even be planets except for the energy (gravitational Pull) of our Sun that holds them together. Without our Sun there is NO “Solar System” or “planets” for us to live in/on. You seem to be getting lost in semantics here. What does the formation of the solar system have to do with contrails? Please try to stay on topic, or I’m going to have to start deleting comments. contrailscience is limited to discussions regarding contrails, things that look like contrails, and their effects. The moon stays in orbit around Earth because of the Sun’s gravitational pull? Not the Earth’s? You live and learn. Sorry James, Joe B. appears to be right. Without the Sun, the Earth would never have formed; thus, the moon is irrelevant without the sun. Joe’s original point was simply that he thinks that global warming is caused by fluctuations in solar radiation, and that “chemtrails” are some attempt to manipulate this effect. The misunderstanding regarding gravity was related to him emphasizing the important role of the sun in the creation of the orbits in the solar system. The moon got where it is because of the sun. But it currently goes around the earth because of the earth. Besides, tides are nothing to do with solar radiation. This serves to confuse the central point here, that there is no evidence that “chemtrails” are anything other than normal persistent contrails. LINE 26 – Uncinus, you have said that different sprays happen below normal contrail levels, so they can’t be chemtrails. HELLO! Chemtrails happen below normal contrail levels, and therefore cannot be a contrail. LINE 60 – I’m not sure what you’re saying here, but it’s giving reasons why chemtrails exist. LINE 129 – When you say that when planes are 2000 feet apart, they can look like they’re side-by-side. Then you state that they’re not allowed to be so close… so they’re not 2000 feet apart and it can be seen that they’re far apart. LINE 143 – You state that chemtrails contribute to global warming; however it is exactly the opposite. They COOL DOWN the planet therefore slowing/reversing global warming. I’m not stating this is the reason they put chemtrails in our atmosphere, I’m just saying it’s a side affect. Hopefully, Uncinus, you will pull your head out from the hole you have so ungraciously shoved it in. I was saying that clouds seeding happens at a lower level than where contrails usually form. Are you claiming that ALL “chemtrails” form at altitudes lower than where contrails form? The point is that if you spray something from a great altitude then it will spread out evenly, and not in clusters. Clusters indicates something is ground based – such as living near a natural source of barium. The 2000 feet is vertical. Planes are allowed to fly with 2000 feet of vertical separation. If they are closer than that vertically, then they need five miles of horizontal separation. If chemtrails are actually persistant contrails or whatever, then why do they spread out all across the sky. If these milky overcasts are from normal contrails, then why isn’t there some scientific group trying to find out how to stop the contrails from spreading out over the sky? Also, on another blog, you said that contrails are contributing to global warming. But if chemtrails are contrails… and they’re covering the sky (which is where the sun is if you were confused about that too)… then how come it’s getting hotter instead of colder, because the rays of the sun can’t get all the way down to the ground. Also, the aircraft that are creating chemtrails are all white. How come there aren’t “persistant contrails” coming from normal planes? Almost all of the time, the planes spreading the chemtrails aren’t following the normal flight patterns, and almost always are breaking flight rules and regulations. How can you explain that, besides the obvious. I just considered something. You’re not so great with the obvious, Uncinus, so the obvious is that they are military aircraft leaving chemtrails. how come it’s getting hotter instead of colder, because the rays of the sun can’t get all the way down to the ground. However, they also trap energy in Earth’s atmosphere and boost the warming effect, the study says. 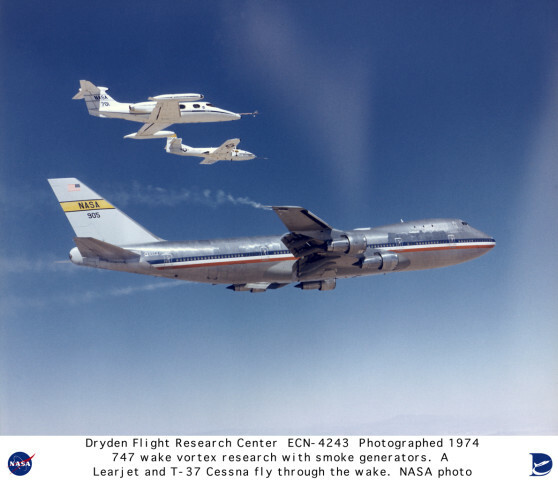 Stuber and other scientists believe that the effect of the contrails is significant. “On average the greenhouse warming effect dominates [the effects of contrails],” said Stuber, a meteorologist at England’s University of Reading. Could you provide some evidence of your claims about the unconventional nature of “chemtrail” aircraft. They seem the normal mixture of jets based on the various photos and videos on the internet. That’s during the day. They reflecting sunlight back into space, as well as bouncing radiant heat from the ground back to the ground. That’s during the night. There’s no sunlight, but they’re STILL bouncing radiant heat from the ground back to the ground. That you can see just by adding up what is happening. Obviously not, if “aircraft are believed to be responsible for 2 to 3 percent of human CO2 emissions”. 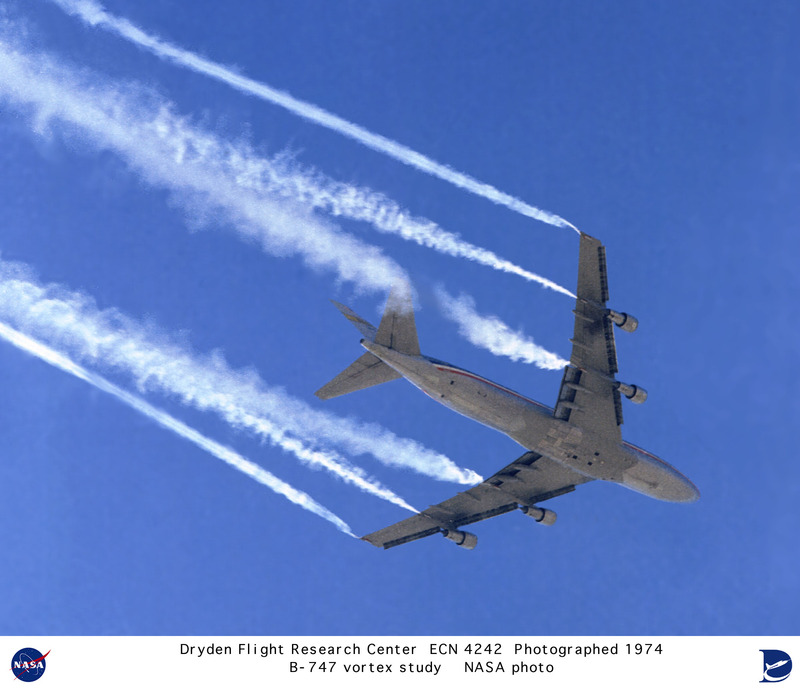 What of the 97 to 98 percent NON-aircraft emissions? I don’t think they are talking about the effect of aircraft C02 emissions, but rather about the radiative forcing from the ice crystals that make up contrails. silver iodide is the nucleus that is in fact a chemical; when dumped this leaves a chemical trail; not like the normally accepted “contrail” that has engine exhaust and condensation as the nucleus. silver iodide is a flat hexagonal shaped crystal that enables it to attract more ice since ice itself is hexagonal in shape. this is why chemtrails stay in the sky longer than contrails. also contrails do not break up mid trail or leave a dotted trail. contrails are mostly ice and do not disrupt normal clouds as silver iodide and ammonium iodide are still visible even as it attempts to, but does not, merge with normal clouds; unlike contrails. this is a wonderful effort to maintain misinformation; as well as validation for items that conspiracy sites confuse as part of weather mod. there are far too many photos and videos showing unusual flight patterns and trails for this subject to be a theory. do not take the uneducated assumptions from sites like, godlikeproductions, abovetopsecret, and prisonplanet only to then associate them generally in efforts to group them into observations of weathermod only to say that chemtrails do not exist. the reason people are reaching out of thin air for explanations is because the majority of people today dont even know about weather modification; they believe it to be science fiction still or even an act that only “god” can perform. nwiwmc.org – NAU type entity that umbrellas weather mod efforts in Mexico, All provinces of Canada, and the UNITED STATES. You say chemtrails are not contrails but after careful examination it becomes evident that old contrails lingered in the sky also. but I would warn against concluding that you are able to discern a chemtrail v. contrail by eyesight alone. I have been scouring old movies and persisting contrails can be seen in old westerns and many other movies going back to the 70’s and before. To Kyle. I see USAF planes flying the same paths above me on contrail free days as well as days that they leave spreading trails. It’s useless to argue about chemtrails. If they spray us they won’t tell us and they’ll make everything in their power to make this quite. The more interesting thing is that in fact they have lied to us on so many occasions that it’s perfectly normal for us not to believe them. Yet most of the people just don’t know and if they know, they just don’t care. “What can we do?” asked a person here, “We are just normal ppl, we can’t fight the government” and thats where you get to the point that the government wanted all along. Slaves that know they are powerless to stop the ruling elite, slaves that are controlled by a corporate society and have been RFID tagged. 90% of the american ppl don’t know how their financial system works. Who prints the money? “The government” say most of the interviewed. But it’s not the government. It’s really sad to see how people are so busy working that they don’t have the desire to research vital things like who controls the monetary supply and why did “we” invade Iraq. You see I’m not an american I live in EU and let me tell you – people around here know more about the USA in terms of government regulations and control then the americans. It’s really sad to see how your own government has dumbed you down to this… Puppets controlled by the TV and the global media. A country ruled by money, that pretends to be the moral authority of the world. Pathetic. I am glad that the americans won WW2 but that doesn’t give you the authority to police the globe. All the pretty words your leaders spew out are just that – words. Your actions speak for themselves. So now that your government brought the war on the civilian american population, who can you blame but yourselves? Marty, the discussion here is really about if there is any good evidence that “chemtrails” are any different from contrails. If they are, then the state of the government or the people is irrelevant, as sensible people should be able to tell the difference. Can you tell the difference between “chemtrails” and contrails? Care to enter that discussion? At last, we agree on something. SENSIBLE people CAN tell the difference! That is why this website that you use as your tool of deception is disgusting and immoral. So true. That is the catylist of your tool of deception. Your job is so easy. The majority of society has already been dumbed down and programmed by the media. Oblivious to what is going on right in front of their own eyes because they are either too busy or focused on an ipod or talking on a cell phone etc… All you have to do is feed them images backed by various government agencies such as NASA or NOAA and lead them to believe that it is proof that everything you say about contrails or chemtrails must be true. In reality, you have provided nothing that proves that the countless reports coming from concerned citizens around the globe are not what they claim them to be. All you do is tell people that they are mistaken, they aren’t really seeing what they think they are seeing and they dont really remember things as clear as they think they do. If that doesn’t work, then you and your cohorts such as (“I cant believe what I am reading”) Jazzroc and SR1419 gang up and ridicule the person and try to portray them as either a conspiracy theorist or some kind of nut job. Then you offer your version of what they must have seen even though you were not there with the person or people that actually wittnessed the event. Then to insult ones intelligence even further, you insist that all of the trails that have been documented in photos and on video that persist and continue to grow and grow and spread out, forming a thick blanket that spreads across the entire sky, under any weather condition, at any location etc… etc… etc…, are nothing more than normal condensation from a jet engine. Whether chemtrails exist or not, do you not see how utterly obsurd your position is on this matter uncinus? You can feed the people with all of your pictures and so called proof of persistent contrails and tell them that it is backed by scientific data and that it has always been this way because you have old photographs to prove it etc… etc… etc…, but in the end, all one has to do is apply simple logic and common sense to tell them that a water vapor trail will dissipate under most conditions and not continue to grow, especially on a hot dry day with practically no humidity in the air. You really are relying on the dumbing down factor to accomplish your mission aren’t you. By the way, where is your proof that any of these photos that you like to refer to are even real? If they are real, then prove that the trails that are depicted in them are actually contrails and not something else. While you are at it, prove that any of the trails documented in the countless photos and videos from around the world and being reported as chemtrails are not chemtrails as claimed to be. “Geoengineering, A Manhattan Project” authored by Jay Michaelson about 10 years ago. It explains in detail about a proposal to “engineer” the global climate in order to counter the “global warming” crisis. (another myth with a hidden agenda) It describes how to accomplish it by utilizing civilian and military aircraft to disperse aluminum and other particles into the atmosphere and even discusses the damage to the environment and the health effects that will result from it as an acceptable circumstance. In conclusion, the N.A.S. found that the most effective global warming mitigation turned out to be the spraying of reflective aerosol compounds into the atmosphere utilizing commercial, military and private aircraft. This preferred mitigation method is designed to create a global atmospheric shield which would increase the planet’s albedo (reflectivity) using aerosol compounds of aluminum and barium oxides, and to introduce ozone generating chemicals into the atmosphere. The full involvement of foremost government agencies, research firms, universities and private corporations are detailed in this global ‘geoengineering’ study. Much of Jim Phelps work was at Oak Ridge National Laboratory, Tennessee (ORNL) which is funded by the U.S. Department of Energy (DOE). He developed the concept of air pharmacology while working at ORNL. The entire art of pharmacology is about how to add one more toxic effect to mitigate another from industry or environment. The chemtrail technique is basically air pharmacology. Of course, uncinus and his cohorts will attempt to discredit anything that I submit for posting on this site, as that is the purpose of this site (to debunk the existence of chemtrails). However, since this site is moderated by uncinus which means that he screens everything first and then posts it after he approves it. Of course, this also gives his crew research time to formulate a response that will always counter anything that is ‘non-contrail’. Bottom line is, you will only see what uncinus wants you to see on this website. I have submitted comments for posting that were not posted for whatever reason. Think for yourself and trust your own judgement and keep looking up. You can feed the people with all of your pictures and so called proof of persistent contrails and tell them that it is backed by scientific data and that it has always been this way because you have old photographs to prove it etc… etc… etc…, but in the end, all one has to do is apply simple logic and common sense to tell them that a water vapor trail will dissipate under most conditions and not continue to grow, especially on a hot dry day with practically no humidity in the air. You really are relying on the dumbing down factor to accomplish your mission aren’t you. No, actually, I’m relying on science. Perhaps you could explain your “simple logic and common sense”, and tell me what numbers it arrives at for the humidity and temperature that would be required for contrails to persist and spread out? Are those numbers different from the numbers that basic science arrives at? Or do you think that all the science books are somehow in on the conspiracy. Conspiracy? Label it how ever you want to. I prefer to stick with reality however. Why does simple logic and common sense have to have numbers attached to it? You see, that’s the beauty of it. Common sense is just that. It does not require a scientific formulation because it is that simple. If it is 110 degrees outside and dry to the bone with no rain in the forecast and not a cloud in the sky, a jet is not going to produce a contrail so thick that it continues to grow and grow without dissipating, forming a thick blanket of whatever it is and eventually falling to the ground instead of evaporating like any other condensation would on a hot day. If I had a device that would produce a cloud of fog from condensated water that allowed me to stand there and spray it out of a nozzle all day long, there would be no sign of the condensation immediately after I shut it off, especially on a hot dry summer day. Why do you need anything other than common sense to see the logic in that? All you are doing by saying things like that is attempting to distort reality and discredit the truth by implying that it cant be true because it was not derived at through some sort of scientific model. If there is any conspiracy going on it is right here with you trying to manipulate the minds of innocent people into believing your ‘contrail theory’ in an attempt to prevent the masses from finding out that we are being sprayed like insects. The reason that you are getting away with it is because the truth is so horrifying that the majority of the people refuse to believe it could actually be happening and that their own government would sell them out like this. Then there is part of the population that is just simply oblivious to any of it and dont have a clue. Unfortunately, those of us that still have any common sense and are still able to think independently without being manipulated are just a minority of the population, which allows you to ridicule and place labels on such as ‘conspiracy theorist’. I am aware that most people would rather stick with the status quo than have a label placed on them and become an outcast even if it means going against their own beliefs. All I can is educate as many people as I can while I can. It is amazing how many people realize it once they actually open their eyes and take the time to actually observe it. They are so busy looking down that they didn’t have a clue. Once they actually stop and look up they are shocked that it has actually been going on right in plain sight yet hiding from them at the same time. It is a real eye opener and a slap in the face at the same time. But it must be done. You have your mission and I have mine. I would much rather have mine any day. I can only imagine having to answer to whoever it is that you have to answer to uncinus, jazzroc, sr1419 and the others of your kind. What is the price to sell your soul for anyway? Common sense is just that. It does not require a scientific formulation because it is that simple. If it is 110 degrees outside and dry to the bone with no rain in the forecast and not a cloud in the sky, a jet is not going to produce a contrail so thick that it continues to grow and grow without dissipating, forming a thick blanket of whatever it is and eventually falling to the ground instead of evaporating like any other condensation would on a hot day. You think they went to the moon using just common sense? Science is useful sometimes. For instance, common sense might tell you that it’s the same temperature at 40,000 feet as it is on the ground. But then, surely even common sense would point out that it gets colder the higher you go. Science gives you a useful rule of thumb, the “lapse rate”, which is the rate at which it gets colder. This actually varies with humidity, which also varies depending on what weather systems are moving in. But a useful rule of thumb is temperature drops 3.5F for every 1000 feet, which is 35F every 10,000 feet. It’s a lot more complicate than that as well, so let’s just stick with common sense. It’s a lot colder where the planes fly. Cold enough to freeze the moisture in the exhaust. Well then uncinus, what you are actually trying to say is that under any weather condition, every jet contrail that is made is going to remain persistent and grow in size until the sky is totally blanketed every time no matter what the weather conditions are like on the ground? If that is not the point that you are trying to make, then perhaps you would like to explain the conditions that a dissipating contrail would be likely to form under. You know, the kind of contrail that me and everyone else that I have talked to, are used to seeing prior to about 10 years ago before this even became an issue. The kind that still exist right along side of the ever expanding freaks that now pollute our skies regularly and sink to the ground without dissipating at all. You may be able to convince alot of easily manipulated people that those ever expanding freaks that you call contrails are “normal”, but there are plenty of people that just know better based on their own life’s experiences, and yes, common sense. There are days when weather conditions are such, that a contrail should normally dissipate like they always have without question. Contrary to what you want everyone to believe, one does not need to seek a scientific explanation to know when something out of the ordinary is taking place. Once again, you throw in your spiel about how science says it could be the right conditions at 40,000 feet and then dodge the subject by throwing out numbers and data and then try to convince people not to trust their own judgement or use any common sense or reasoning that does not involve a scientific formula. Sure, science is useful sometimes uncinus, and sometimes it is also used when it need not be used. Sometimes it is used manipulate and to distract from the basic issues. When used in that way, the intentions are never good. No, I’m saying that for contrails to persist and spread there needs to be particular atmospheric conditions where the plane is flying. The conditions are obviously going to be VERY different from the conditions on the ground. It’s not just me saying this. It’s every single book or article on atmospheric physics, clouds, meteorology, the weather, etc. Are you saying that every books on clouds written in the last hundred years is wrong, and that you are right? Once again you have sidestepped the issue and failed to answer the question. First of all, I have always said that for contrails to persist and spread there needs to be particular atmospheric conditions. That is actually the point I have been trying to make. I am very aware of the fact that the conditions are different on the ground then they are at 40,000 feet. So why are you even bringing this up? Because you cant answer the real question? Also, as usual, you feel that it is necessary to add to it by telling me that it is in all of the books on clouds etc… when this is something that I am aware of and absolutely agree with. I have never implied that I disagree with that. So, to avoid the real issue, you throw in your little stab at my credibility and start rambling on about something completely irrellevent. It is the last line that shows your true colors however, when you insinuate that I think I am right and all of the books are wrong. Why would you even say that except to attack my credibility? If you are not involved in this sickening act against humanity then what motivates you to attack my character anyway. Why are you so consumed with making sure that nobody believes the personal experiences of people from all around the world who are reporting about it? This website alone is an indication of your obsession with it. You are so determined to make sure that no one believes any of these peoples reorts of their personal experiences just because because you assume that they are mistaken when you have no way of actually knowing that for sure. That just creates more reason for people to be concerned. Try to stick to the subject next time and just answer the question without sidestepping it and taking a stab at my character or credibility. Or is that too much to ask? rudedog, I’m not trying to take a stab at your character or your credibility, and I’m sorry if I gave you that impression. I also apologize to not answering your question, I thought I had done so. You’ve written a lot above, and I’m not sure what question you are now referring to. If you would like a answer, then could your state your question again in one or two sentences? Thanks. I am very impressed with this site and the patience dealing with comments. Being a complete airplane nut I was mostly impressed with the aircraft modifications explained here. People coming in to this argument need to realize that the distance to 30,000′ is very far, 5,280′ is a mile, so its a ways up, in that distance there are many variations in air currents, weather patterns, temperatures, etc. that can disrupt or change the appearance of contrails, any literal spraying of chemicals (and i’m not going to deny that it is done, but it isn’t a secret) must be done at very low altitudes. I witnessed aerial drops in the fires this year in california and they are quite a spectacle, very low flying, large planes flying in, over, through very rough terrain. 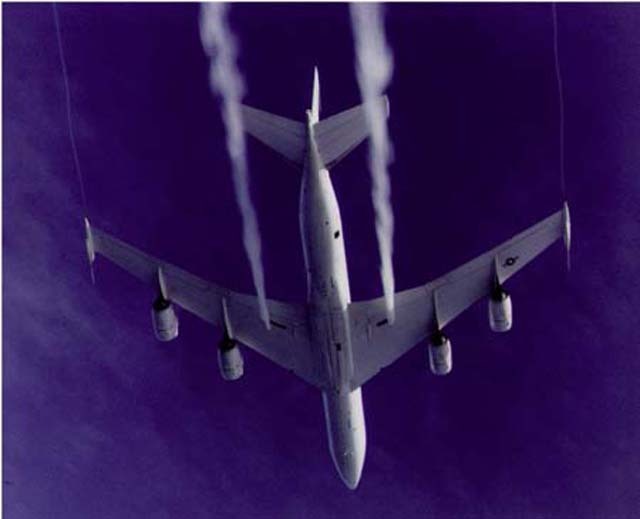 If “spraying” was being done as tests on the public, it would have to be done through low flying tankers, as high altitude drops would be almost no effect, or very delayed. This theory is the only one that has absolutely no basis on fact that I have seen, a little research on the effects of air currents and a little knowledge of aircraft is all thats needed to completely laugh at these claims. From just sifting through the comments it looks like this thread is a fantastic source of information about all of these claims. Now I would love to see the video, or time lapse of a so called chemtrail sinking to the ground. Contrails can exit close to the ground, but only in conditions where the air close to the ground is as the air is many 10 of thousands of feet high. This can happen near the north or south poles. I applaud you for using common sense, as it shows individuality, thinking is how the human race advanced. However, you have to listen to others, and science as well. Science gives you the ability to enter this forum and comment, not common sense. Contrails have been 100% proved to be ice crystals forming around the aerosols ejected by an engine operating, generally at high altitude, in favorable conditions. I guess in one way of thinking, you could then say it is then a chemtrail as it has these aerosols, which are essentially chemicals. The whole argument here though is really, are the contrails just a result of aircraft exhaust and have no use, or are they “sprayed” and have a sinister use. That is the conspiracy. I am really a lot more worried, and so should everyone else be, by the exhaust fumes vehicles and factories pump out right into the air we actually breath. Now that CAN make you sick. Investigation into trails tells us that they expand over time. But someone else seeing this expanding might apply the logic that if something gets bigger it means it’s getting closer. That is why I believe that some people think that the trails sink. Good point. The human brain did not evolve to judge the height or distance of clouds. So if a cloud spreads out towards the horizon, then some people might well think it was sinking towards the ground. A few photos should be able to settle this. They certainly do! In fact, by so much as to be scarcely credible! And if you’re not sure what “three to four orders of magnitude”, it means by a factor between ONE thousand and TEN thousand times. This means that it is possible for a 5,000 kilometre Boeing 747 flight through a saturated stratosphere to put EIGHTY THOUSAND TONS of ice into the sky! There are aircraft that do conduct some type of spraying. I have personally observed multiple aircraft spraying emiting these trails and other aircraft higher than these with the standard contrail behind them not emitting. After the spraying would occur these trails would desperse and clouds would begin to form. The air quality was also noticibly poorer as well after the spraying. These aircraft do exist and are spraying something, tomorrow rain is forecast for my area I will observe the orgin of the rain (checking to see if clouds move in from the ocean as they normally do generally coming up the coast from Mexico or west from the Pacific instead of “forming” over land) as well as attempting to observe any spraying. How do you know they are “spraying” and not just leaving a persistent contrail? The differences in trails you witnessed could be from planes flying through different pockets of air…or different planes with different types of engines. Engine types play a role in contrail formation for a number of reasons. To say a plane is definitely “spraying” something with the only evidence being a persistent trail viewed from at least 6 miles away is not a logical nor likely scenario. You are doing yourself a great disservice to automatically assume they are “spraying” something simply because you see a trail persist and spread in cirrus clouds. haha, this website is funny. Come on my “head in the sand” crew, it is all mapped out for the millitary right here in this report that was done in 1996! What does the Military say about that? military objectives and it does not reflect current military policy, practice, or capability. and has no plans to do so in the future. universities, scientific organizations, and major media publications. Who would be doing this spraying in New Zealand? Our airforce is nothing but a handful of (old) transport planes. Our government doesn’t even let US navy ships into our harbours. Why would they play along with this particular ‘experiment’? but we will buy shrill fear-mongering based on lies and devoid of evidence. I dont know whats going on…all I know is that here in New Mexico I can see streaks forming over albuquerque and to the north over Sante Fe. I live in the desert and can see very far in every direction…the contrails seem to cluster around the populated areas and leave the deserts untouched…Im lucky to live in a desert I guess. I have seen planes fly over my house leaving a normal contrail and in the distance suddenly start leaving a constant streak over albuquerque that will last for an entire day! this happens over and over again all day somtimes lasting for weeks on end. SOMETHING IS HAPPENING AND ITS NOT CONTRAILS. Hi, I find your arguments rational if a little one sided – i have no proof either way but you seem unable to even imagine that the chemtrails could be real? I can certainly imagine it – it’s not hard to imagine a secret spraying program. The point is that there is no evidence that this is actually happening. All the supposed “chemtrails” look EXACTLY like contrails. This cannot be true as there is a trail it is flying along quite close to it that is perfectly well formed – look again! Its in parallel flight next to a trail (of whatever kind) and its trail suddenly stops even though the trail next to it is perfectly visible – proof that the air could support contrail formation – plus i dont see how the air could have such a deliniation of air typesin such a neat way? also i found a document from the us military wrote recently that admits they ARE spraying barium so there IS something to some of the chemtrail theory ! http://www.uk-pollutantdeposition.ceh.ac.uk/sites/uk-pollutantdeposition.ceh.ac.uk/files/UK_HeavyMetals_Final_report_2006_final_version.pdf i would save you the hassle of reading all 120 pages – take a look at the table on page 20. So there is proof they are spraying barium compounds to act as a kind of aerial antenna. What do you say to that? Whether or not they mean us harm is up for discussion but they are aware of the potential health effects (see later down the page in the first link). Light scattering pigment powder particles, surface treated to minimize inparticle cohesive forces, are dispensed from a jet mill deagglomerator as separate single particles to produce a powder contrail having maximum visibility or radiation scattering ability for a given weight material.Attorney, Agent, or Firm: Sciascia; Richard S.; St. Amand; Joseph M.; Primary/Assistant Examiners: Blix; Trygve M.; Kelmachter; Barry L.
US1619183* 3 /1927 Bradner et al. The present invention relates to method and apparatus for contrail generation and the like. 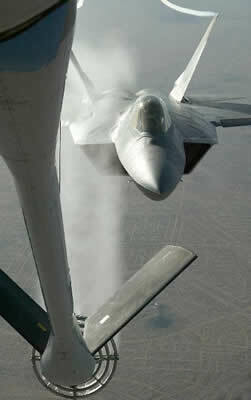 An earlier known method in use for contrail generation involves oil smoke trails produced by injecting liquid oil directly into the hot jet exhaust of an aircraft target vehicle. The oil vaporizes and recondenses being the aircraft producing a brilliant white trail. Oil smoke trail production requires a minimum of equipment; and, the material is low in cost and readily available. 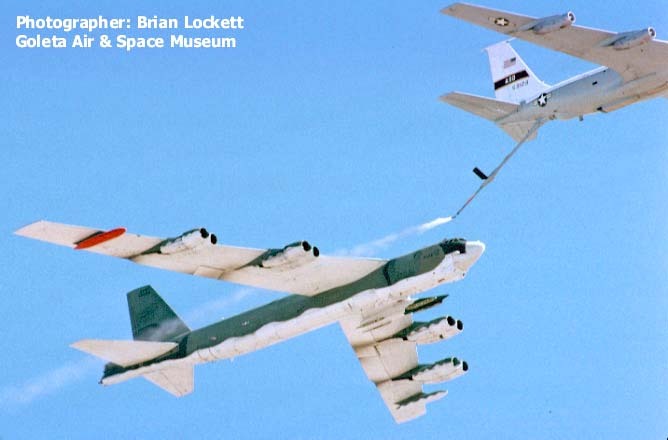 However, oil smoke requires a heat source to vaporize the liquid oil and not all aircraft target vehicles, notably towed targets, have such a heat source. Also, at altitudes above about 25,000 feet oil smoke visibility degrades rapidly. RADIO SIGNALS, BARIUM, BOTTOM, RADIO RECEPTION. the signal reflected from the base of the cloud. Basically a contrail stops when the added water from the exhaust is no longer able to saturate the air. Starting and stopping contrails can be compared with patches of cloudson a sunny day, they are a nice indication of the variety of the athmosphere. phasma, could you perhaps show how any of that relates to what people describe as “chemtrails”? Could YOU show a photo of this spraying going on? Looking at page 20 of your link, Table 7 shows a range of barium in the air from 0.59 to 4.34 ng/m3 (nanograms per cubic meter). Can you explain exactly what this indicates?